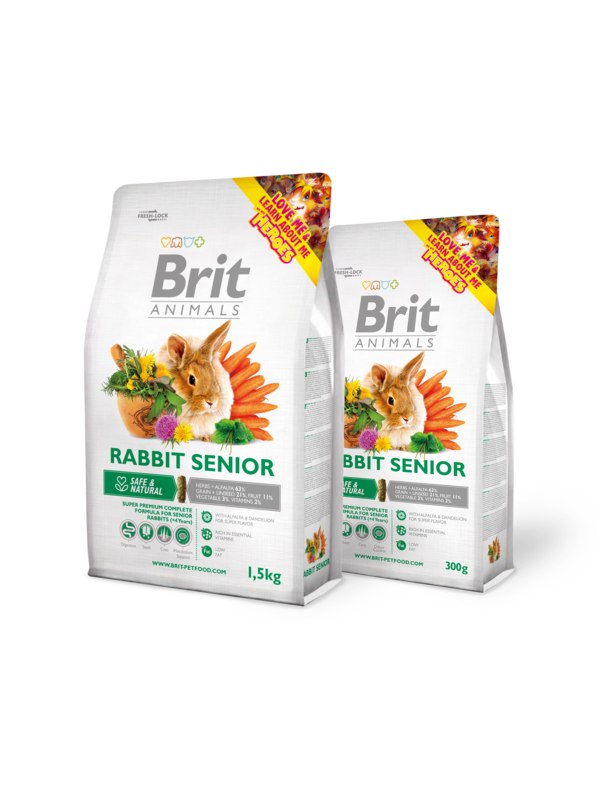 Super premium complete food for senior rabbits (above 4 years of age). High content of vitamin C 720 mg/kg provides natural protection against cell-ageing. Low protein 13.5 % does not overstress the organism and support healthy digestion in the less active period. Ideal ratio of calcium and phosphorus comply with the natural ratio in the meadow hay 1,75 : 1 – and it lowers the risk of urine stones. crude protein 13,5 %, crude fat 2,8 %, crude fiber 19,0 %, crude ash 8,2 %, moisture 10,0 %, calcium 0,7 %, phosphorus 0,4 %, sodium 0,06 %. vitamin A 10 200 I.U., vitamin D3 1 250 I.U., vitamin E (α-tocopherol) 70 mg, vitamin C 720 mg, vitamin K 0,1 mg, vitamin B1 1 mg, vitamin B2 2 mg, vitamin B3 6 mg, vitamin B5 3,5 mg, vitamin B6 1 mg, vitamin B9 0,12 mg, vitamin B12 0,02 mg, biotin 1 mg, choline-chloride 200 mg, zinc 72 mg, iron 40 mg, manganese 54 mg, copper 10 mg, iodine 1,8 mg, selenium 0,21 mg.